A computer lab, a ginourmos factory,and out in the field are all the places you could work with a job in engineering. With any job in engineering, you get to work in exciting places.You can choose what kind you would like to go into. 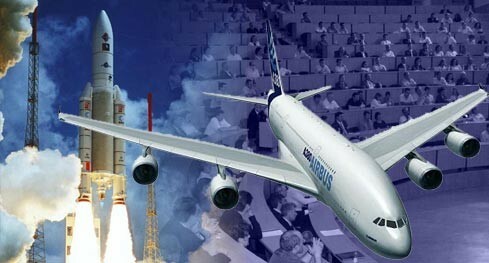 With aerospace engineering it is becoming more technical as engineering becomes more advanced. One of the first important people in the aerospace industry was Leonardo DA vinci. He started by looking at birds and he was interested to build something that can imitate a birds flight. A few years after, he had realized it was harder than it seemed. A couple of years later the wright brothers came into the picture and were the first to build a successful airplane. And since then it has come a long way. in this century you have to have a lot of experience. No company is looking for a person who knows nothing about the field.You have to have a bachelors degree to even be considered for a job. Some jobs only take you if you are a citizen of the U.S., in high school you need to take different courses to be prepared for college. Aerospace engineering differs from the other types because it is the only type that deals with the sky and what goes into it. There are many steps that go into it, designing, manufacturing/engineering, then the final test is to discifer if its ready to go. aerospace engineering only has one field it can go into which means more focus on one topic.It also has alot of differences than the others,like it is the most expensive engineering job. About half of all its jobs are plant jobs because of the uniqueness of its products. He industry is very dependent on highly trained workers. The best three colleges you can go to are the Massachusetts institute of technology, the California institute of technology, and Stanford university. more than half of all aerospace product is for the department of defense, and the national aeronautics and space administration. "did you know engineering is one of the best paid jobs EVER! ..........No not really". But the job amounts can range from 30 dollars per hour to 75 dollars per hour, That's if you have a lot of experience. Aerospace engineering is becoming more technical day by day. That's why I think it is the best field you can go into. "Aerospace Engineering Jobs." EngineerJobs.com. N.p., n.d. Web. 12 Nov. 2014. "Best Aviation Schools." - Find Aviation Training Programs Worldwide. N.p., n.d. Web. 12 Nov. 2014. "Career Cornerstone Center: Careers in Science, Technology, Engineering, Math and Medicine." Career Cornerstone Center: Careers in Science, Technology, Engineering, Math and Medicine. N.p., n.d. Web. 12 Nov. 2014. "Engineer Blogs." Engineer Blogs. N.p., n.d. Web. 12 Nov. 2014. "Top Engineering Colleges." - Best Engineering Schools in USA. N.p., n.d. Web. 12 Nov. 2014. "UNITED STATES DEPARTMENT OF LABOR." U.S. Department of Labor. N.p., n.d. Web. 11 Nov. 2014. "The Yale-New Haven Teachers Institute." The Yale-New Haven Teachers Institute. N.p., n.d. Web. 12 Nov. 2014.